Author Roland Colton stops by today to talk about historical fiction. Roland is a lawyer, a pianist, an author and, at one time, a terrific baseball player. He has the good fortune to live in Southern California and France. His novel Forever Gentleman has just released. MKTod: What are the magic ingredients that make historical fiction unforgettable/irresistible? RColton: Perhaps the most critical ingredient in making historical fiction unforgettable is attention to historical detail. I believe a reader must be transported back to the time and setting of the story. The manuscript should not offer a single word, phrase, or description inconsistent with the era, or the illusion of time displacement will be compromised. A writer must be able to create the sights, smells and sounds of the era that he or she is writing about. Another important ingredient is to subtly reference events of the time as a backdrop for the plot and action. For example, in my book, which takes place in 1869-70 London, the city is on the verge of emerging from chronic sewage failures and cholera and typhoid epidemics wrought by the unsanitary conditions and overflow of the malignant Thames. A further ingredient is to create a narrative voice consistent with writers of the time. For me, I attempted to use a voice reminiscent of nineteenth century authors, in order to lend more authenticity to the story. In addition, it’s important that characters behave and interact with others in a way that is believable and rational for the period. Of course, an ingredient applicable to all novels is a great story with proper pacing that keeps the reader engrossed until the last line is read. In my experience, contemporary novels normally don’t involve as much attention to detail as do historical novels. For a historical novel to be successful, the reader must truly believe she is traveling back in time and witnessing the events unfolding in the book. For a contemporary novel, there is not the need to paint the story’s landscape in as much detail, since there is no time displacement. The reader is generally accepting of the current era, and there is not as much need to weave in contemporary events, inventions, or other mores. In most instances, contemporary books are written in contemporary verse; there is no need to create an altered dialogue or accent to mimic a bygone era. What aspect about the past do you specifically try to highlight in your novel? One area highlighted in my novel is music. I have a passion for music, which I attempted to weave into the story. Today, we listen to classical work written during the eighteenth or nineteenth century, as if it were a voice from the distant past. I attempt to make those compositions more current and relevant; I want the reader to experience classical music as contemporary works of the era. This happens dramatically in my novel when Nathan first hears the lovely strains of Tchaikovsky’s Nur wer die Sehnsucht kennt, written just a few months before. I also endeavored to portray the explosion of genius in music that occurred during the nineteenth century. Describing music with words presents a unique challenge, and I did my best to describe the harmony, nuances and dynamics in such a way as to help the reader appreciate the beauty and significance to the story. In writing historical fiction, what research and techniques do you use to ensure that conflict, plot, setting, dialogue and characters are true to the time period? As the plot began to germinate in my mind, I wanted the voice to be reminiscent of nineteenth-century authors, so I immersed myself in novels written in that era. I also wanted to create realism involving concerts, plays and other events the characters attend. I had the good fortune of locating weekly periodicals for the era, including The Athenæum and The Musical Word (which I describe in in the Author’s Note at the end of the book), that not only provided the concert program, but also identified the performer and critiqued the performances. I was also fortunate to acquire old maps of London to ensure that the boroughs, locals and streets were properly named for the year my story occurs, such as Weller’s Map of London 1868. One exceptionally value tool was Claude Booth’s Descriptive Map of London Property 1889, which graphically portrays, by color, the lowest class to the upper class. These maps were instrumental in identifying the economic areas where events took place and navigating the main character through the streets of London. Another marvelous resource tool was The Victorian Web which helped describe the street vendors, food offerings, street sweepers, and a host of other facts necessary to depict London as it was a hundred and fifty years ago. I believe that all aspects of the world need to be created, including a depiction in detail of the sights, sounds and smells of the era. The clothing, home decor, food, table settings, all need to be authentic. If the characters go to a museum, the author needs to insure that the pieces of art were present in that museum during the time the story takes place. If characters go to a park, the author needs to describe it as it was in that day. If the characters frequent a building or place that no longer exists, then it’s important that the author learn everything about that building/place in order to describe it accurately. As I stated above, dialogue of the times is important, as well as the character’s motivations for the actions they take. One trend I see in historical fiction is the inclusion of a person or persons famous enough to allow the reader to identify with the time the story takes place. In some instances, it seems as though the writer is taking a short-cut to circumvent the very serious and detailed research necessary to properly construct the past. I believe such books sometimes suffer as a result and become too heavily dependent on the historical personage(s). Another trend involves authors writing multiple books containing the same characters and plot; sometimes, sequel after sequel inhibits the freshness and creative freedom of the story. Please tell us about your latest novel. In Forever Gentleman, readers will travel back in time and experience Victorian London at its best and worst—a city of beauty and brilliance, yet steeped in filth and despair. Nathan Sinclair, a struggling young architect and gifted pianist, lives in the two vastly different worlds, mingling in high society while dwelling in suffocating debt and poverty. While performing at a gathering of London’s elite, Nathan meets Jocelyn Charlesworth, a breathtakingly beautiful but temperamental celebrity heiress. He is smitten, though she publicly humiliates him; their paths intersect again later, and they form a tentative friendship centered on their mutual love of music. Meanwhile, Nathan makes the acquaintance of Regina Lancaster, a woman of remarkable inner beauty, despite her pedestrian appearance. He must decide whether to follow his heart and pursue Regina, or flee England altogether to avoid imprisonment from a miserly creditor. In his darkest hour, Nathan is offered a tantalizing proposition that might change everything, but that comes at considerable risk. Nathan must play his role perfectly, or he may lose his reputation, livelihood, and very life to the powerful echelons of Victorian society. 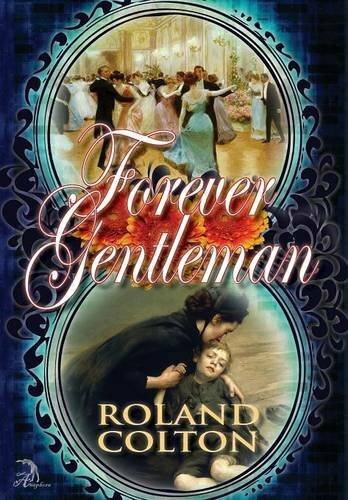 Full of unexpected twists and turns, Forever Gentleman races towards a thrilling climax that will determine Nathan’s ultimate destiny. Many thanks for being on the blog today, Roland. I wish you great success with Forever Gentleman. Great interview – thanks for posting!